Meanwhile lets just say that we are proud Linda Paterson contributed a whooping 2 entries. 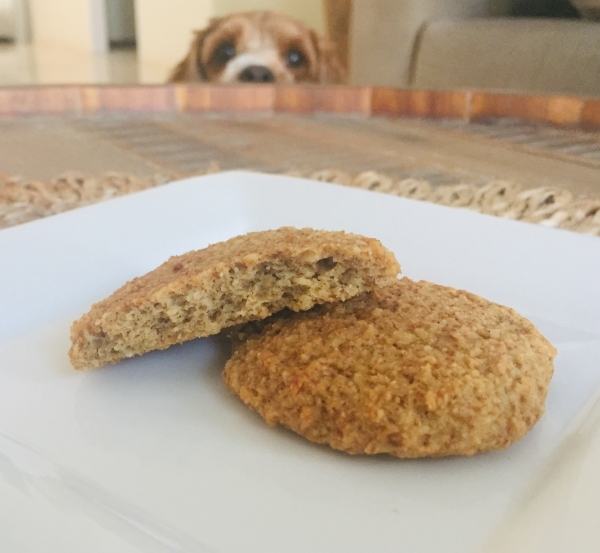 This recipe is appropriate for people who are following the full GAPS Diet and who do not have serious digestive issues. 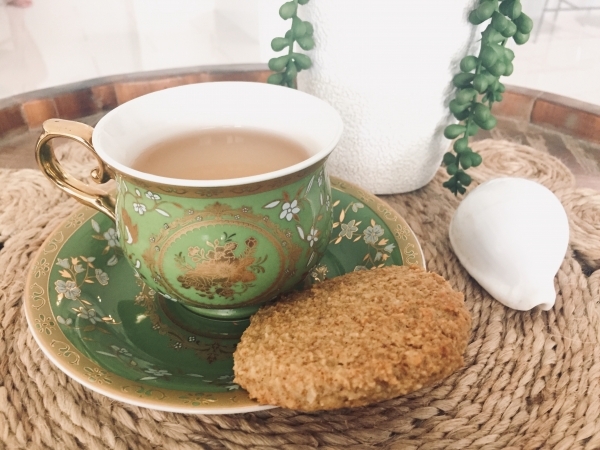 Mix all coconut meat ingredients in a saucepan on medium heat until all ingredients is well combined and melted and then mix in a food processor to grind the dessicated coconut a little finer. Line a 8×6 inch dish with bleach free baking paper and pour the ingredients into the dish and push down flat. Place the coconut meat mixture dish into the freezer and leave for 4 hours or overnight. When the mixture has set hard, pull the sides of the baking paper up to pull out the coconut mixture out of the dish and place it on a chopping board. With a long sharp knife, carefully cut the coconut fudge middle meat into even squares. Place the squares into a container with a lid back into the freezer for preparation for the chocolate coating step. Simmer some water on a low heat in a saucepan and place a glass bowl over the simmering water. Add the cacao butter to the glass bowl and melt the cacao butter completely. (CAUTION: Keep the heat at a low temperature so that the steam does not cause any water residue within the glass bowl and make sure all your utensils and materials do not have any water on them because any water contaminating the mixture will cause lumps and clumps and spoil the smooth chocolate result). Once melted, turn off the heat and add the cocao powder gradually whilst stirring continuously with a bone dry whisk until mixed well with no lumps. Add honey and vanilla essence and continue to whisk. When the mixture is lovely and smooth it is ready for the coconut meat fudge dipping. 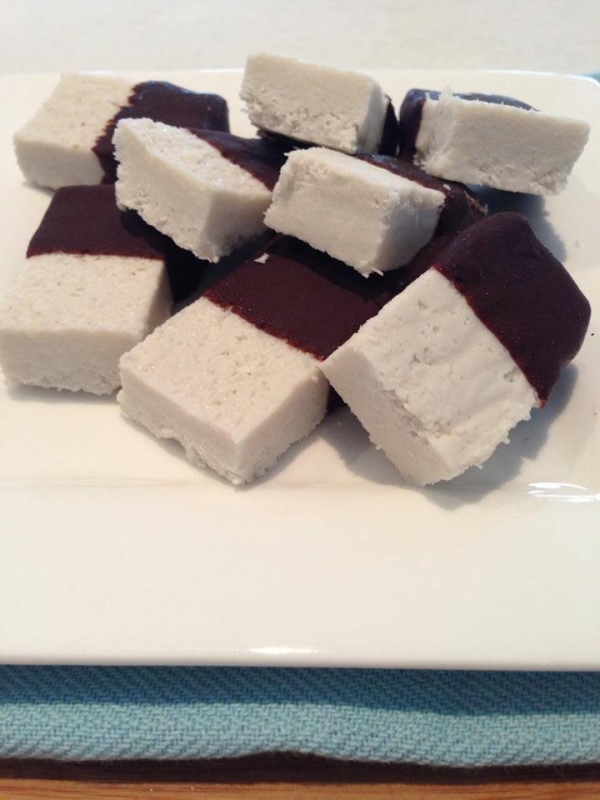 Take the chopped coconut meat squares from the freezer and place one square on top of a fork. Dip the square into the chocolate so that it covers only half of the slice. (you can cover the entire slice if you want to and this can be done by dropping it into the choc mixture and then lifting it with the fork from the bottom and let the excess chocolate drip off. The cold coconut squares will start to harden the outer layer of chocolate as you lay the squares down onto some bleach free baking paper on a tray to set. Place the choc covered squares into the fridge for 10 minutes to set. These are reasonably stable at room temperature. OPTIONAL: You may wish to add a teaspoon of organic mint flavour to the mixture if desired. This recipe is appropriate for people who are following the Full GAPS Diet. Mix all ingredients in a bowl with a spoon, followed by massaging all the contents and squeezing the ingredients in your hands where you can feel the mixture starting to stick together. Depending on the consistency of the mixture, add more nut butter or coconut oil if it is too dry or more nut flour if it is too moist. You want to create a cookie dough so keep mixing and squeezing the contents with your hands so that the mixture can form a big ball ready for making smaller balls. When you have rolled the cookie mixture into a ball on the bench top, pinch a section of the dough and roll the section into a ball approximately 4cm in width. Continue this until you have 20 balls ready. Place each ball into mini round cardboard baking cups. These will be used as the mold for the entire cheesecake and they should be 5cm wide measured from the bottom. Press the first layer with your thumb by pushing the ball down flat to make a base in the bottom of the cup ensureing it reaches all the sides with good coverage. 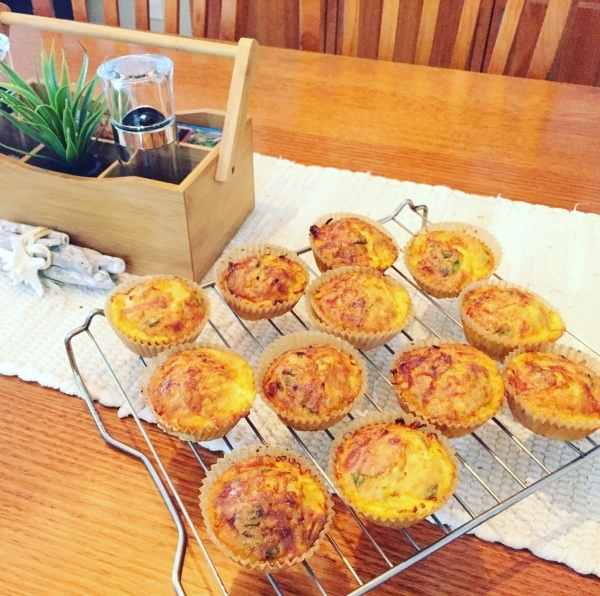 Place the baking cups onto a baking tray and place the tray in the preheated oven at no more than 150 degrees Celsius for 10 minutes, keeping a close eye on them to ensure they do not burn. Almond flour burns easily so do not cook any higher than 150 degrees Celsius. 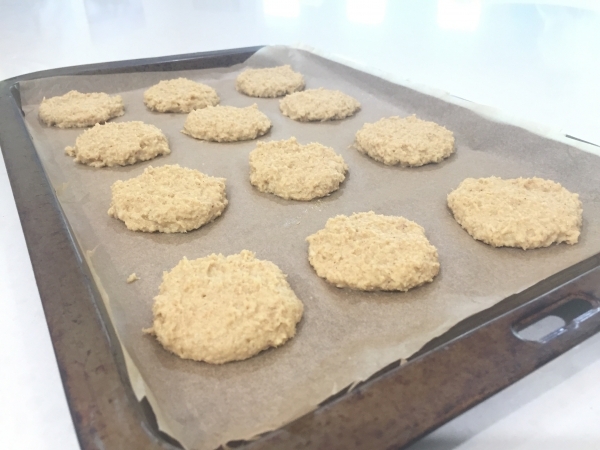 Remove the tray from the oven after 10 minutes and let the cookies cool for 5 minutes and then place them in the fridge for 15 minutes to cool whilst you prepare the next layer. 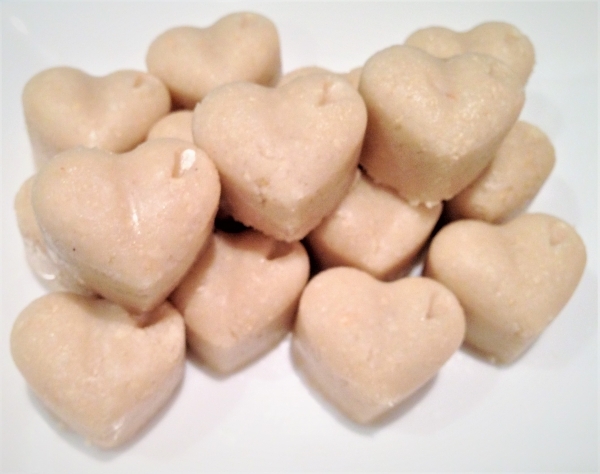 Soak cashews in water for 20 minutes and then rince them and drain off the water. 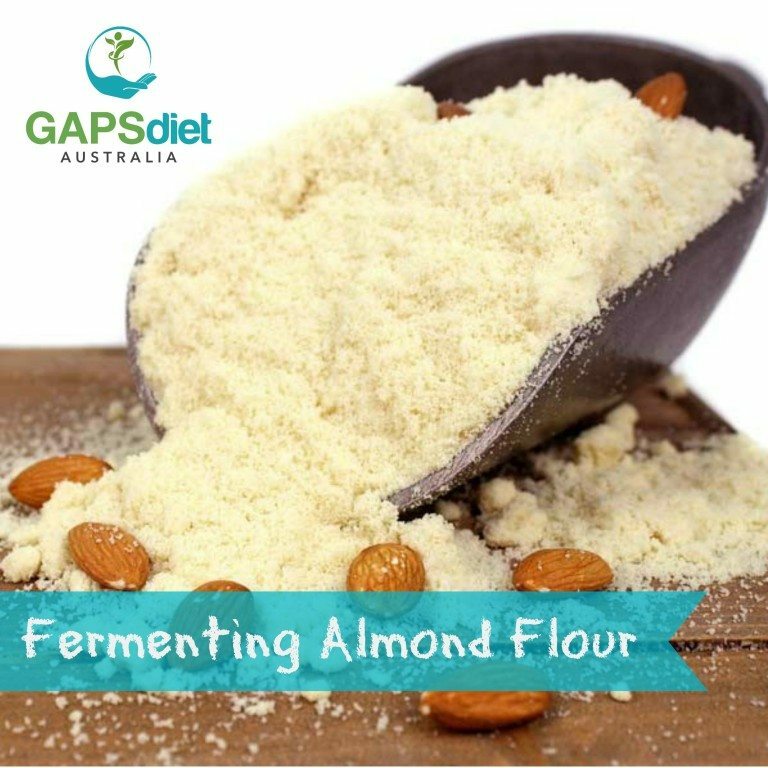 Add Cashews to the thermomix or strong mixer and mix on a high speed to break down the nuts into a flour like consistency. Add coconut oil and coconut milk to the mixture and continue to blend whilst occasionally stopping to wipe down the sides with the spatula to ensure all the ingredients are blended together evenly. Add honey, vanilla essence, mint flavour and mint leaves. The mint leaves are optional because they do require a lot of blending and pulsing to break them down into a paste along with the nut and coconut mixture. They do contribute slightly to the flavour and add some colour. If you wish to add more colour, add the spirulina powder. Continue to mix and blend whilst occasionally stopping to wipe down the sides with the spatula to ensure all the ingredients are blended together evenly. Keep blending until you establish a nice creamy like texture. Remove the baking cups from the fridge and add a spoonful of the mixture until all the ingredients is evenly dispersed in each cup. With the back of a teaspoon, level out the mint layer so that it is reasonably flat and place the cups in the freezer for 15 minutes. Remove from stove and mix ingredients in a food processor to grind the desiccated coconut a little finer. 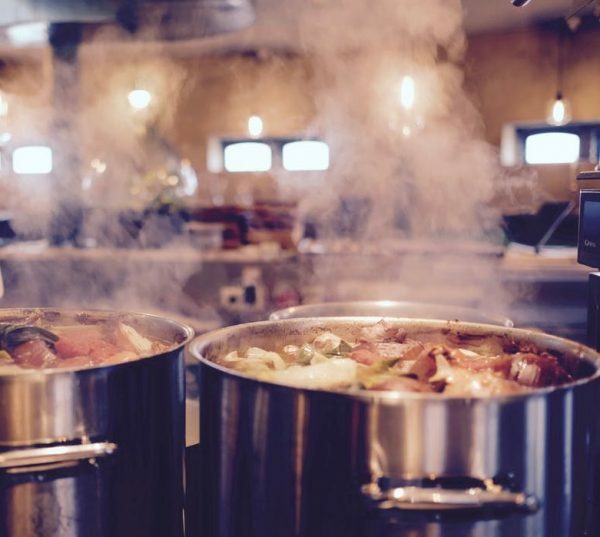 Simmer some water on a low heat in a saucepan and place a glass bowl over the simmering water. I like to use a pyrex jug (size measures 4 cups) for this as it works nicely to pour the ingredients later. Add the cacao butter to the glass bowl and melt the cacao butter completely. (CAUTION: Keep the heat at a low temperature so that the steam does not cause any water residue within the glass bowl and make sure all your utensils and materials do not have any water on them because any water contaminating the mixture will cause lumps and clumps and spoil the smooth chocolate result). 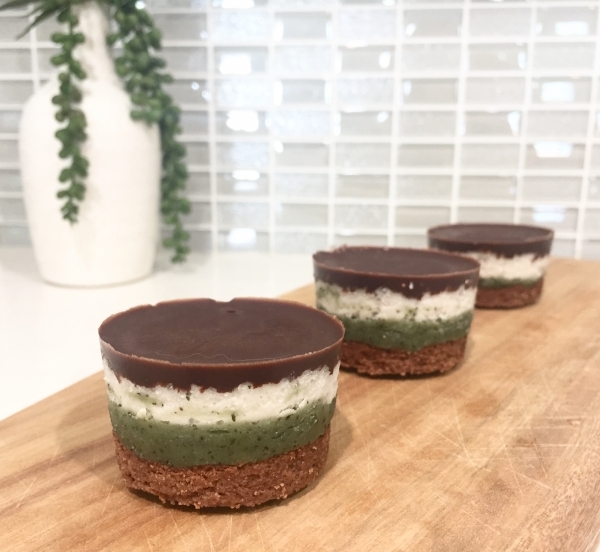 Remove the baking cups from the freezer and pour chocolate mixture over the top until all the ingredients is evenly dispersed in each cup to provide good coverage as the top layer. Try not to make the top layer too thick to make it easier to bite into the cheesecake. Refrigerate for 1hour to set. When all ingredients have set, you can tear the cardboard paper cups and slowly remove the cheesecake medallions from the cup casing to expose them for serving. 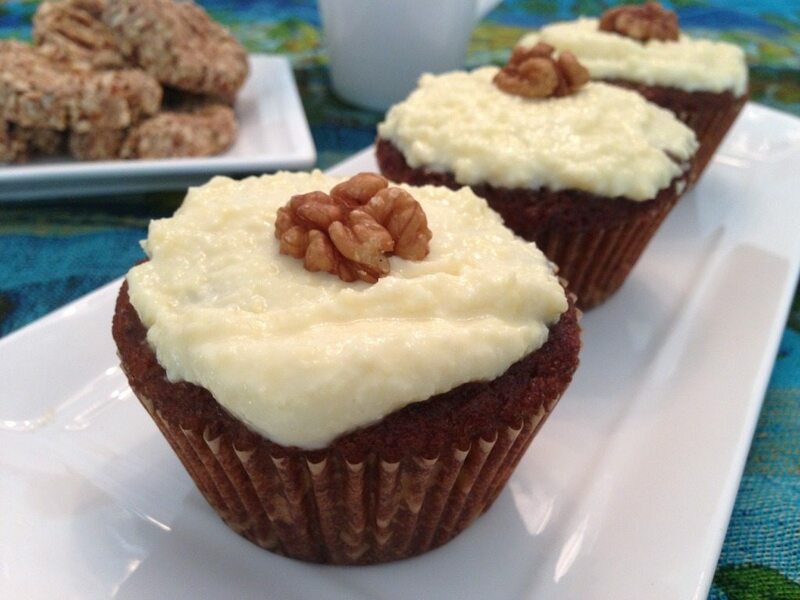 I recommend you keep them in the baking cups until you are ready to serve or eat. Preheat oven to 150˚C and prepare one large or two medium stainless steel trays by lining them with (bleach free) baking paper. Add all the ingredients into a bowl (except for the desiccated coconut and bicarbonate of soda). Mix the mixture with electric beaters or other mixer/thermomix. I used electric hand held beaters for this recipe. When well combined, add the desiccated coconut and add the bicarbonate of soda last. Spoon a tablespoon of mixture neatly onto the prepared lined baking trays and pat gently with the flat of one finger so that the mixture resembles a rounded semi-flat shape. 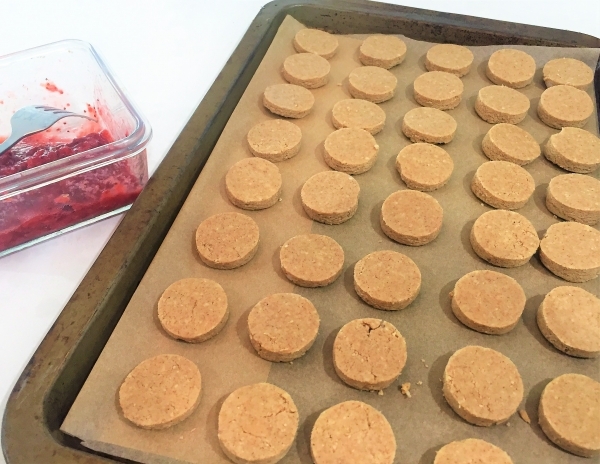 Place the baking tray into the preheated oven and bake for 15 minutes. Do not be tempted to cook longer than this as the cookies will burn. If your oven tends to cook quickly, you may want to remove them sooner. The edges and tops should be browned but not burnt. Once removed from the oven, carefully slide the liner off the tray and onto a cooling tray with the cookies still in place. Let them cool this way for ten minutes to allow the cookies to cool. DO NOT try to pick them up as they will be soft and fall apart. When they are cool to touch and are becoming more solid, remove the paper lining under the cookies so that the bottoms don’t sweat. Allow the cookies to cool for a further 20 – 30 minutes on the cooling tray. 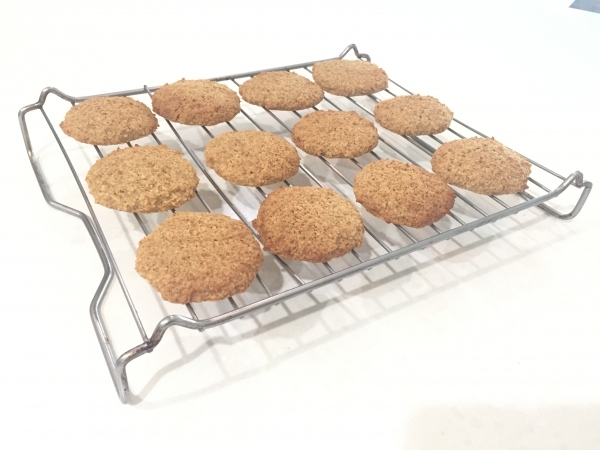 If you wish to have crunchy crispy cookies, you need to go one step further and place them in the dehydrator at 135 ˚C for about 6 – 7 hours. I use the excalibur dehydrator. These cookies will make a golden crunch when you bit into them and should be stored in an air tight container. 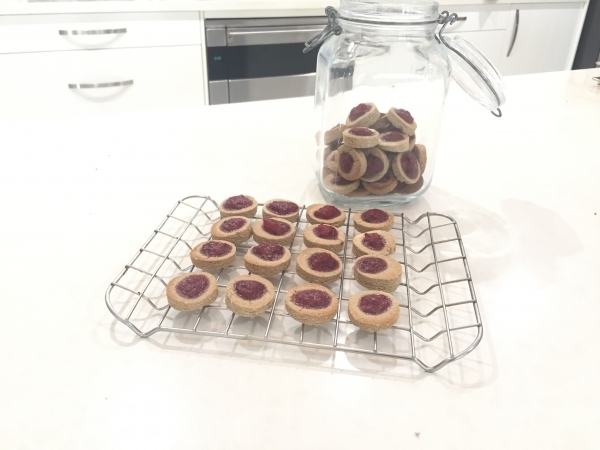 These cookies can last several weeks or more when kept in an air tight container. The Excalibur food dehydrator is the best on the market. I have had mine for ten years and it is still going strong. We have a few Excalibur Dehydrator options available at GAPS Diet Australia based on affordability and specification. If you do purchase one, I highly recommend the one with a timer. This helps greatly when dehydrating food on an ongoing basis. You can make little faces on these cookies with a variety of different expressions and call them emotion cookies or you can make small gingerbread men for Christmas. At this stage, you can create different face imprints on the cookies using a teaspoon for a smile and a pointy object of sorts for the eyes. There are lots of things you can use in the kitchen to do this. Alternatively, you can just keep them plain or add jam to the top. 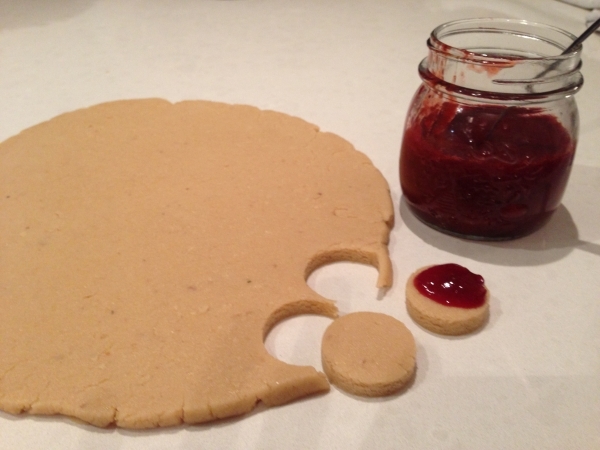 JAM DROPS: If you wish to make jam drops, refer to the prepared jam mixture from the below instructions and spoon a teaspoon of the jam on the top of the cookie. 2 - 3 tbl Celtic or Himalayan Sea Salt Salt is a traditional ingredient in sauerkraut because it increases shelf life, texture, and flavor. The amount of salt used can vary according to personal taste but too little can spoit the batch. The salt helps to preserve. Thinly slice or shred the cabbage and place it into a large bowl. A good quality mandolin is great for shredding. A big cooking pot is good to contain the cabbage for this will allow you to easily get your hands into the mix later. Add a generous amount of salt to the mixture and mix the salt into the cabbage with your hands. Let it sit for 10 – 20 minutes to allow the salt to draw out some of the cabbage juice naturally. Salt actually allows the cabbage to sweat so that juices can be extracted to create the brine. 2 tablesppons of salt per 1kg cabbage. After you have allowed the cabbage to sit for 20 minutes, mix, massage and knead the ingredients with your hands. Bruising the cabbage this way allows the cabbage to extract more natural brine solution. Keep kneading until you have squeezed a substantial amount of juice from the mixture. This may take approximately 10-20 minutes. It is always handy to have someone with strong hands to do the kneading & massaging. Place the cabbage mixture into the selected kraut vessel and pack and push the mixture down so that the cabbage is compacted in the bottom and the juice is sitting on the top of the cabbage with a minimum of 4 - 5cm’s or 2 inches of the juice above. It is important to push the cabbage down firmly so that no air is trapped and the cabbage is completely submerged in and under its own brine juice. A cabbage/vegetable pounder or potato masher can be a good tool for this. Most fermented vegetable kits will have a weight but if you do not have a kit with a weight, simply make your own weight by using a plate that fits snug in the fermenting vessle and place it on the top of the cabbage and then place a smaller jar (filled with water) on top of the plate to weigh the cabbage down and keep it submerged. Push the jar down and you will see more juice rise to the top. It is very important to ensure that all the sauerkraut is submerged under its own juice. Don’t worry if you don’t have a weight to push it down, just try to make sure that all the cabbage remains under the brine and if any bits float up, remove them throughout the process to prevent them from going mouldy. When all the cabage is submerged under its own juices with the weight keeping it down, cover the top with a double folded cheesecloth to keep away the dust and store in a dark place for four weeks (ie pantry). If you use a canning jar with a rubber ring top, and close the lid, be sure to burp it a few times in the first few days to release the pressure or it will burst - you won’t need the cheesecloth if you use this type of jar. Keep checking to remove any mould or scum build up floating on the top and make sure the kraut remains under its own juices. The sauerkraut may be consumed and ready to eat after 2 weeks but it matures better and contains more good bacteria wioth more time. The sauerkraut may be stored in the fridge after 2 - 4 weeks of fermentation. If there is any scum or mould development on the top – remove this. The kraut remaining under the juice will be fine. After the cabbage has completed the fermentation process it becomes preserved and will last up to 12 months in the fridge. Fermentation is the traditional way we preserved food before companies decided to create synthetic harmful preservative options. The juice remaining in the kraut jar is a by-product of the sauerkraut but it is just as probiotic and benneficial to consume as the kraut itself. Do not discard the juice, either leave it in the jar and consume it gradually along with the kraut or strain it into a bottle to use as a fermented probiotic drink. This juice is what we like to use in the introduction stages of the GAPS Diet. It is introduced slowely and methodically. Refer to the GAPS introduction stagesfor this method. This is a wild feremtnation method which often takes a little more time to ferment naturally, however you can assist this process further by inoculating the kraut batch with good bacteria from the very beginning by adding a vegetable starter culture to the mixture and massage that through with your hands along with the salt. You may add other vegetables like grated carrots and other favourites such as caraway seeds or dill. If for any reason the cabbage is not submerged under enough of its own juices, you may need to add a small amount of filtered water with more salt (15 gms of salt to 1 ltr). Add 1 cup of almonds and cover with a tea towel or cheese cloth. Soak the nuts in the salt water brine for 12 hours in total, ensuring that you rinse the nuts twice during this time. When rinsing the nuts under filtered water the second time, aim to remove the salt residue and discard the salt water brine. Place the nuts in a clean jug or bowl and add 1 - 2 teaspoons of flaxseeds (optional) remainig 4 cups of water and place in the fridge for 2 – 3 hours. Adding the flaxseeds will allow the milk to thicken a little more. Exclude this step if you have no concern for thickness. If you wish to add a little sweetener to the milk, this will be the stage that you will need to add the pitted dates to the mixture to soak for a few hours. This is optional. Add the soaked nut mixture from the fridge (including the water) to a good strong blender, vitamix or thermo mixer and blend for as long as it takes to break down the size of the nuts into a pulp consistency. Place a nut milk bag or cheesecloth over a bowl and pour the milk mixture through the cheesecloth or nut milk bag like a strainer. When all the pulp and liquid has been strained through the nut milk bag or cheesecloth, squeeze any excess milk from the pulp mixture with your hands, allowing the milk to drain through the cloth. If you find that the milk is too rich, simply add more filtered water. Store in the fridge for 2 – 3 days. Preheat your oven to approximately 60 – 120 Degrees Celsius. Add a large block of unsalted organic butter to a glass or stainless steel oven dish and leave it in the oven for 45 – 60 minutes. The liquid in the dish will separate with milk solids on the bottom (liquid creamy white colour), ghee in the middle (yellow) with some floaty bits of whey on top (crusty yellow and golden brown floaty bits). 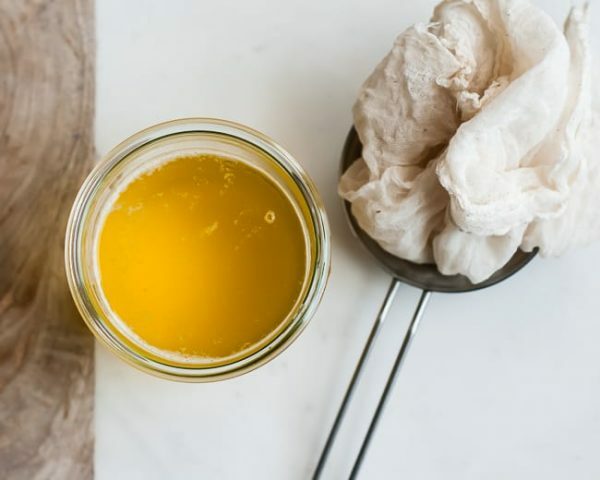 The whey can be carefully scooped out from the top with a tea strainer and the yellow liquid which is the ghee can be carefully poured into a jar with a cheese cloth on top to catch any whey or unwanted milk solids. Try not to disrupt the milk solids and ensure that they remain in the bottom of the pan as you pour out the ghee. Discard the milk solids and refrigerate the ghee in glass jars. Melt the unsalted butter in a saucepan over low heat. Don't stir. 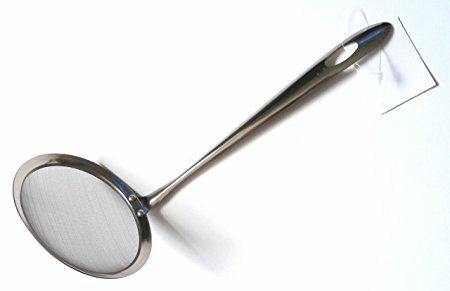 Remove the foam with a flat head stainless steel seive straining spoon (see image). On the bottom, you'll now see white milk protein, which you want to leave behind in the pan or filter out of your ghee. Carefully pour the clarified butter through a cheese cloth. The white milk protein should remain in the cloth, while the clear butterfat seeps through. Other Options: You can use your slow cooker to make ghee. Put the butter in it and turn on low heat for 6-8 hours. Then follow the steps above. Leave the bowl or dish on the kitchen bench top at room temperature for 24 hours. When 24 hours have passed, drain the flour through a cheescloth and use the drained flour directly in baking. Pour the mixture into bleach free baking cup cake holders linned within a 12 tin muffin tray and bake in a preheated oven at 175 degrees Celsius for 30 minutes. You can also make a carrot cake with this mixture but you will need to adjust the cooking time. You do not want the mixture to be too runny. If it is, simply add a little more almond flour to accommodate. Skin the fish and remove the bones, cut into mouth size pieces. Put the pieces of the fish into the jar mixing with slightly crushed peppercorns, a few slices of white onion (optional), coriander seeds, bay leaves and dill seeds or dill herb. In a separate jug add ½ litre of water and dissolve 1 tablespoon of sea salt and 3-4 tablespoons of your homemade whey. Pour this brine into the jar with the fish until the fish is completely covered; if the fish is not covered just add more water. Close the jar tightly and leave to ferment for 3-5 days at a room temperature, then store in the fridge. This fish does not keep long, so consume in the next few days. Serve with avocado, lemons and onions. Another way to ferment fish: buy some fresh sardines (also works for herring and mackerel), de-scale the fish, cut the heads off and clean the belly out. Put into a suitable size glass jar or a stainless steel pan. Add 1-2 cups of whey, 1-2 tablespoons of salt (per 1 litre), a teaspoon of black pepper corns (freshly crushed), 10 bay leaves and ½ a teaspoon of coriander seeds (freshly crushed). Top up with water so the fish is completely covered with water, you may want to float a small plate on top of the fish to keep it submerged in the brine. Cover the pan or put the lid on the jar and let it ferment for 3-5 days at a room temperature. 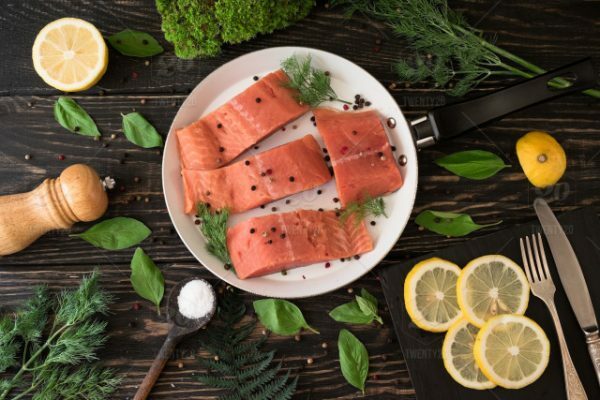 When the fish is ready take the meat off the bones, cut into bite-size pieces and serve with avocado, fresh dill and some chopped red onion. Heat the oven to 140 degrees Celsius. 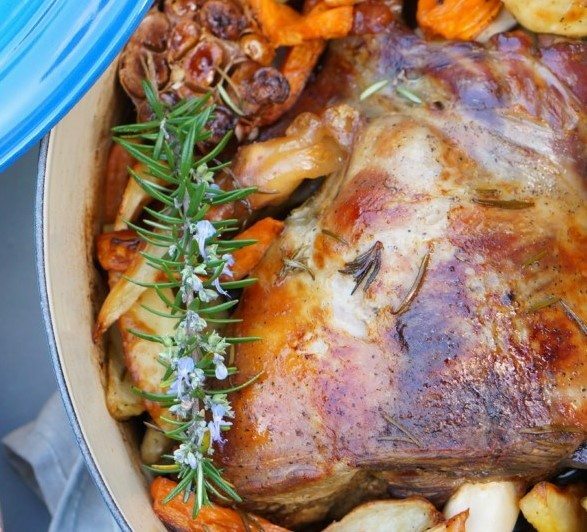 Place your meat joint or other selection of meat into an oval cast iron pot and fill 2/3 with filtered water. 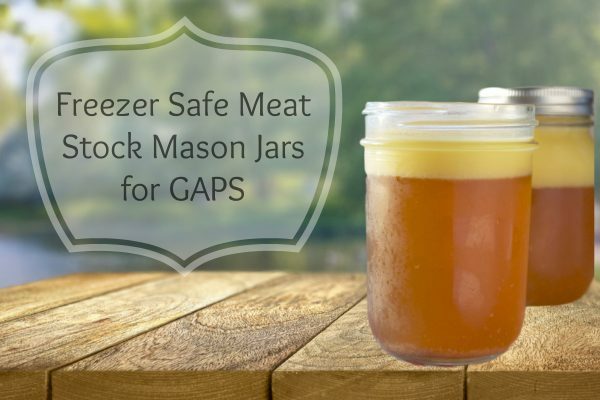 Be sure not to cover the meat joint completely with water, because the exposed part at the top of the meat produces a lovely tasting stock for drinking. This recipe should allow you to save a few jars of stock when you are done. If tollerated (see recipe notes) dice some onion and celery and crush some garlic and saute in a seperate pan with a little lamb fat or duck fat and add to the pot. It is often nicew to salt the top of the lamb and add some of the sauteed ingredints on top as well as surrounding the lamb in the stock. Add salt, dried herbs, bay leaves and a sprig of rosemary. Cover with the pot with the lid and cook on very low heat for 4-6 hours (125 – 140 degrees Celsius). After 4 or 5 hours add a variety of chopped vegetables . We have made some suggestions for you above that work nicely but feel free to experiment with seasonal organic vegetables. At this time it is essential to leave the lid off in the final stages of cooking and increase the temperature to 180 degrees celsius and cook for a further 40-50 minutes. When cooked, serve the meat and vegetables and use the stock (strained through a sieve) for a warm drink with your meal. Keep left over stock in the fridge or freezer for later meals or stock drinks. You can use any of the following meats (joint meats are easier to digest than muscle meats) Try to use a broad range of different meats each time you cook this meal. You may experiment by adding a variety of vegetables keeping a broad range in your diet, however make sure you are ready for them - Refer to clinical notes. The fat content of these meals need to be quite high: the more fresh animal fats you consume the faster the recovery. Be sure to add fermented vegetables with every serving. If you are still in the introduction stage, avoid spices at this stage and only use herbs, salt, and bay leaves. This meal is easy to cook and provides you with a variety of options to choose from. If you make a large batch, this meal is easily frozen and defrosted and heated in a glass Pyrex dish with a glass lid in the oven. Cooking several of these meals and freezing them will allow you to have a break in the kitchen. Avoid vegetables and consume only the meat and stock from this recipe if the patient is experiencing profuse diarrhoea. Vegetables should be added gradually until well tollerated and digestion improves. Meat stock provides important building blocks for the rapidly growing cells in the gut lining and has a soothing effect on any area of inflammation in the gut. That is why they aid digestion and have been known for centuries as healing folk remedies for the digestive tract. Do not use commercially available soup stock granules or bouillon cubes, they are highly processed and are full of detrimental ingredients. Chicken stock is particularly gentle on the stomach and is very good to start from. To make good meat stock you need joints, bones, gelatinous meat (which is meat on the bone like a whole chicken, lamb necks/shanks or osso buco cuts), giblets from chicken, goose or duck, whole pigeons, pheasants or other inexpensive meats. It is essential to use bones and joints, as they provide the healing substances, not so much the muscle meats. Ask your butcher to cut some large tubular marrow bones in half, so you can get the bone marrow out of them after cooking. The bone marrow can be added to soup broths or eaten just as it is. Meat stock and bone broth are two different things. Meat stock is made over a few hours with raw bones and meat, where as bone broth is made with old cooked bones and cooked over 12 – 24 hours. The intro diet suggests using meat stock and when intro is complete, you can try the bone broth if you want to. This recipe has supplied a few options of bones and meat cuts to choose from, however you are not limited to them. Other cuts from goat and game etc can also be used and are very delicious. Dr Natasha Campbell-McBride strongly recommends local game sources for nourishment.